"Every week there's so many ways to play the economic story ... at Fox it's only the upbeat." I should preface my review by saying I don't consider myself a card carrying member of either political party. Candidates on both sides have appealed to my core political values and more often than not I find myself disenfranchised as a result of the constant mud slinging coming from both camps. 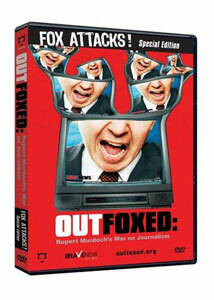 I was in college the first time Outfoxed: Rupert Murdoch's War on Journalism was released to DVD. It was over the summer prior to the 2004 elections and people on campus were frothing at the mouth to get their hands on this. Of course, unsurprisingly, they were people who already loathed the Fox network with every fiber of the being. This film was nothing more than fuel to their fire. And that's the problem with Outfoxed. It's an interesting documentary, compulsively watchable and entertaining. But it's a thesis statement never proven true. It begins with the statement that the Fox News channel is the most biased network in journalism, a ball of right-wing propaganda that refuses to propagate any political viewpoint other than its own. I'm not sure anyone would disagree with that. And from there, there's no place left to go and it's not going to change the mind of anyone watching it. Those who've come to watch Fox �get theirs� will undoubtedly find this a vindicating experience, and those who've come to see what arguments the filmmakers have leveled against the network will find little more than a repetitive bore. My problem with Outfoxed is a recurring one. There's simply not much here: A small montage of Bill O'Rielly telling guests to shut up repeatedly illustrates the bully pulpit news style of the network. There's an examination of how political opinion is casually inserted into stories across all network programming. Perhaps most amusing (and more than a little shameless), however, is the attempt to discredit the small amount of liberal commentators on the network based on their looks. The Hannity and Colmes show is called into particular question here for showing a �good looking, clean cut, All-American kind of guy� as the Republican and the �squirrelly-looking� person as the Democrat. Come on. It's probably no secret that I didn't glean much value from Outfoxed. That's true. That's probably because I don't watch Fox news with any regularity and when I do, the information I receive is taken with a massive grain of salt. My slant against Outfoxed (Fox news, and any biased news source, while we're at it) isn't necessarily the content of these programs themselves. It's the troubling fact that people are going to take this stuff for gospel without question. Outfoxed can be a fun counter-point to the right-wing network, but it's never more than that. If taken on those terms, however, there's some value and enjoyment to be had in its slanted proceedings. Image Transfer Review: Outfoxed is largely compiled from archival footage. The image here is suitable though there's nothing stunning to see here. That said, there's no problem with the transfer. The footage used is almost entirely made up of news broadcasts. It's not going to stun you, but it's surely as clean-looking as you're apt to get. Audio Transfer Review: Just as the image quality doesn't dazzle, the audio leaves the same impression. This film is 100% dialogue and it's clearly rendered through the main channel speaker. Extras Review: This 2008 release ports some of the features over from the previous release: An introduction with director Robert Greenwald (02m:37s) where he explains his motivations for making this film. Behind the Scenes of Outfoxed (28m:30s) which is a very droll interview with several of the production's participants. There's some interesting information spread across these thirty minutes, but there's a lot of bunk also. Lastly, there's a Catching up with the Newshounds featurette where we see what the documentary's reporters have been doing since the completion of the project. It runs 5 minutes. The new collection of features are five short documentaries, each of them under the Fox Attacks! banner. Here is where you can see the filmmaker's motivations for rereleasing this title again. Each feature is tied directly to the upcoming election as it attempts to show how Fox is still skewering the facts and reporting on unimportant aspects of Barrack Obama's campaign. Obama runs just north of four minutes and shows snippets of several Fox stories focusing on the Democratic Presidential candidate. There's optional commentary by director Robert Greenwald here. Black America runs almost the same length of the previous featurette and touches upon similar elements as well. There's optional commentary here by James Rucker, executive director of ColorOfChange.org. FOX ATTACKS! and the Fox Democratic Debate runs just under 4 minutes and details the grassroots campaign to stop the Nevada Democratic Party from having a debate on Fox. There is optional commentary by Kim Haddow, director of communications for the Sierra Club. Lastly, Fox Is Wrong! Global Warming, is the most interesting and amusing of the bonus features. Clocking in under three minutes, this takes a game show approach to Fox's flippant approach to global warming, including buzzers sounding off at each and every piece of misinformation revealed. This new edition of Outfoxed is a repackaged propaganda piece intended for the 2004 election. As a result, the main film is already a bit dated. Those looking for a balanced point/counterpoint argument about the validity of the Fox News Network can look elsewhere, but if you're looking for additional fuel for an anti-Fox fire, this is a slickly produced little effort. I didn't particularly take to its agenda, but it does wrangle some of Fox's most shameless moments out of the shadows for all to see, and some of that is admittedly very interesting. This new DVD edition packs some worthwhile extras along with the film (pertaining to the upcoming election... big surprise) so if you don't have the previous edition and this stuff is up your alley, this new version is well worth picking up.